Marcus Mariota was named the Associated Press Player of the Year today in a landslide victory, collecting 49 of the 54 available votes. Mariota is the first player from the University of Oregon to be awarded this honor since its inception in 1998. 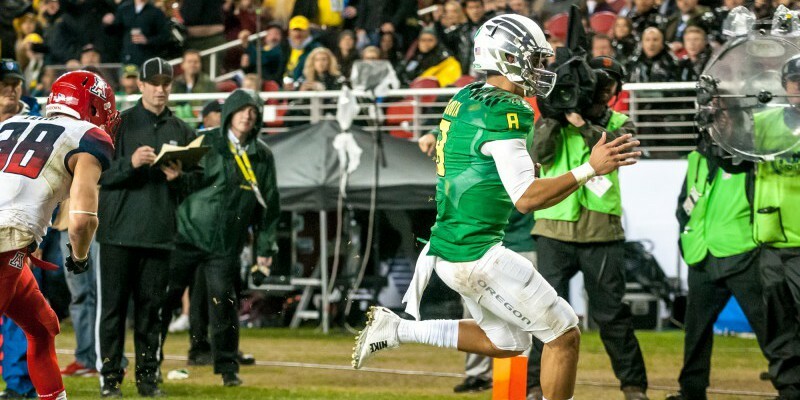 The addition of the AP PoY award, alongside the Sporting News Player of the Year which was announced December 17th, makes the Ducks Junior QB seven for seven during for the 2014 award season for all relevant awards. Mariota was also named the Walter Camp, Maxwell, Polynesian and Davey O’Brien Player of the Year to go with his Johnny Unitas Golden Arm award, and of course, the first ever Heisman Trophy at the University of Oregon. Joining Mariota on the SN All-American team was Oregon center and roommate Hroniss Grasu, who is a potential first or second round draft pick in the 2015 NFL Draft. Adding the AP and SN awards leaves only two individual awards left for the young man whose legacy will last for a very long time. Still left to add to the mantel? – the Rose Bowl MVP and the College Football Championship MVP. As with the other awards, the collection of those trophies will reflect more than just individual performance. In order for Mariota to add those to the awards case at the University of Oregon, the Ducks will first need to beat the defending National Champion Florida State Seminoles, and win the Rose Bowl, and then accomplish yet another first — bring home a National Championship. No easy task for any team, but one that Mariota and the Ducks have prepared for all season long. For Mariota, who has said he would trade in all of his hardware for a team win, collecting the National Championship MVP award is one trophy he wouldn’t have to trade for anything. A National Championship MVP means that Mariota has accomplished everything he and the Oregon Ducks set out for at the start of the 2014 season – to win it all.